Happy New Year, everyone! With the holiday season squarely behind us, it's time to take down the decorations (if you haven't already) and focus on getting organized for the year ahead. 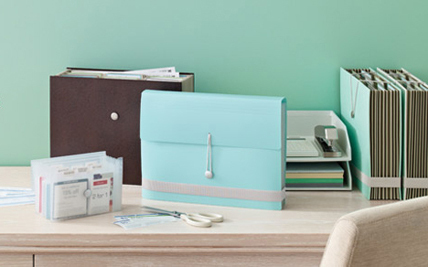 What better way to inspire a sense of efficiency than a new line of home office supplies designed by Martha Stewart? 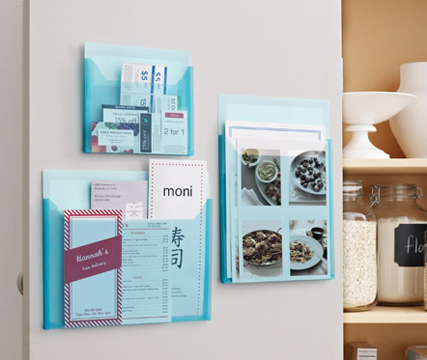 There are over 300 different items in numerous home-organization categories, including binders, dividers, binder accessories, sheet protectors, journals, notebooks, notepads, file-folder labels, kitchen labels, color-coding labels, textured and metallic labels, kraft labels, permanent labels, tags, bands, sticky notes and note tabs, file folders, accordion files, pockets, storage boxes, drawers and trays, organizers and accessories. Whew! What strikes me most about the line are the colors - they are SO Martha. 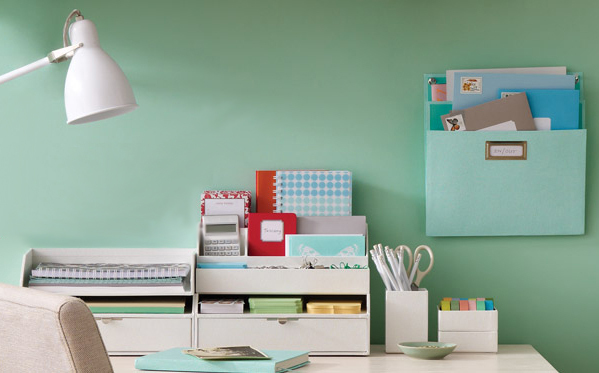 Products come in shades of teal, beige, gray, various pastels as well as bolder primaries. The other impressive quality is how imaginative the products are. A sign of excellent design is something I like to call the "why-didn't-I-think-of-that" factor. Many of these products elicited that excited reaction. Below are some examples from the line. 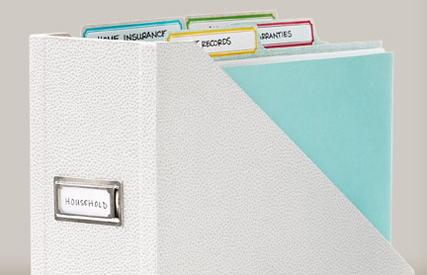 Accordion folders keep everything organized for tax time. 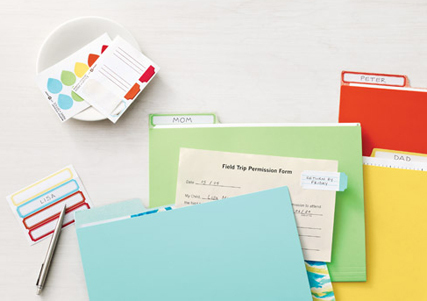 Color-coding is a great way to keep organized: assign a different colour to each member of the family or each category you are filing. A sturdy tray containing some of the Martha Stewart journals and notebooks. I am most impressed by the assortment of kitchen labels available in this line. They are practical, useful and attractive. There is nothing like these labels anywhere else! 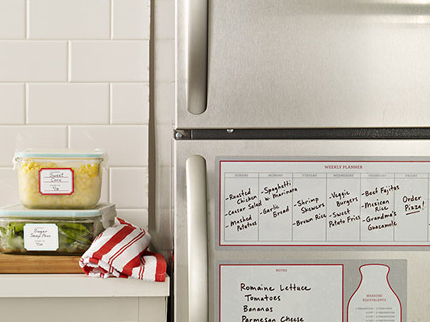 Pantry pockets hang neatly on the pantry door and contain recipes, coupons and take-out menus. 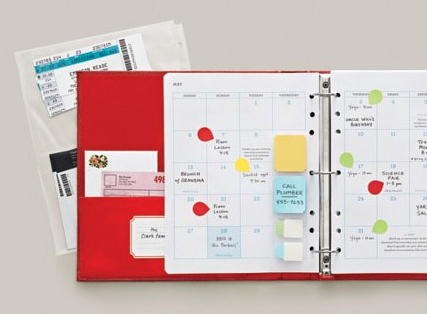 A colorful and well-maintained planner keeps everyone on track - even you! Magazine holders can double as a portable filing unit if you fill it with vertical folders containing your most frequently-used documents. 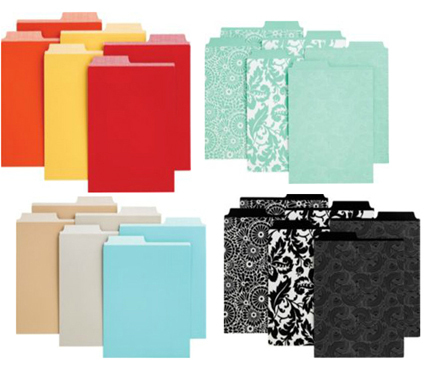 The vertical file folders come in many different shades and designs. I haven't seen them in person yet, but I'm drooling in anticipation! I already have my list! I am catching up on blogs today, sorry for the many comments. I am delighted and can't wait to see these. 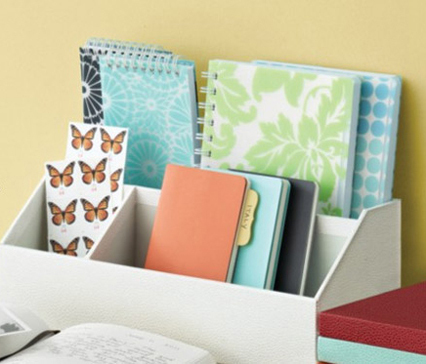 Exactly what people who enjoy nice-looking organization solutions need!